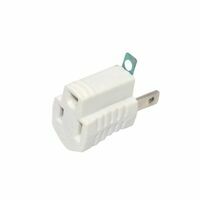 Cooper Wiring Outlet Adapter, Grounding, 125 VAC, 15 A, 1 Outlets, 2 Wires, 2 Poles, NEMA 1-15R - NEMA 5-15R, Polypropylene, White, cULus Listed, Plug-In Connection Polypropylene ribbed body. Solid brass blades for long life and low heat rise at full load. Converts 2 pole polarized outlet to 3 wire grounding outlet. Safety tab extends face on adapter to assure grouping plug cannot be plugged in incorrectly. 15 amp, 125 volt. UL Listed. Spring action plug provides cord grip for easy storage on appliances such as vacuum cleaners, fans, etc. Made of high impact-resistant thermoplastic for long-term durability. Cord diameter 0.328". Listed to UL 498 (file no. E15012) NOM Certified. Meets flammability requirements per UL 94, VO rated. Temperature rating: -20 to +60 degrees C. NEMA 1-15. Impact resistant thermoplastic housing with finger grip grooves. Plug blades are firmly embedded in body. Polarized. NEMA 1-15, UL Listed. Carded. General duty, meets all UL 498 requirements. Plug blades are firmly embedded in body. 15 amp, 125 volt. .328" cord diameter. NEMA 1-15. Spring action plug provides cord grip for easy storage on appliances such as vacuum cleaners, fans, etc. Made of high impact-resistant thermoplastic for long-term durability. Cord diameter 0.328". Listed to UL 498 (file no. E15012) NOM Certified. Meets flammability requirements per UL 94, VO rated. Temperature rating: -20 to +60 degrees C. NEMA 1-15. Connects a 3-conductor grounded plug to a 2-conductor polarized receptacle. Primelight? indicator light shows when the power is on. Grounding retainer ring. Size:1.20" D X 3.90" W X 6.75" H. Connects a 3-conductor grounded plug to a 2-conductor polarized receptacle. 15A/125V/1875W. General duty, made of high impact-resistant PVC and ABS thermoplastic for long-term durability. Clip provides cord grip for easy storage on appliances. Listed to UL 498 (file no.E15012), CSA Certified (file no.LR2081 (6221-02, 622182). NOM Certified. Meets flammability requirements per UL 94, VO rated. Temperature rating: -20 to +60 degrees C. NEMA 1-15. General duty, made of high impact-resistant PVC and ABS thermoplastic for long-term durability. Clip provides cord grip for easy storage on appliances. Listed to UL 498 (file no.E15012), CSA Certified (file no.LR2081 (6221-02, 622182). NOM Certified. Meets flammability requirements per UL 94, VO rated. Temperature rating: -20 to +60 degrees C. NEMA 1-15. Cooper Wiring Cord Connector, Polarized, Spring Action, Straight Body, 125 V, 15 A, 2 Poles, 2 Wires, Nema: 1-15, Non-Grounding Grounding, Cable Range: 0.33 in, Thermoplastic Body, Black, cULus Listed UL498, CSA Certified, For Vacuum Cleaners and Fans Plug blades are firmly embedded into insulating body. 15 amp, 125 volt. .406" cord diameter. Converts a single receptacle into three outlets. Molded of high impact-resistant plastic for long-term durability. 15 amp, 125 volt. UL Listed. Converts a single receptacle into three outlets. Molded of high impact-resistant plastic for long-term durability. 15 amp, 125 volt. UL Listed. Converts a single receptacle into three outlets. Molded of high impact-resistant plastic for long-term durability. 15 amp, 125 volt. UL Listed. High impact-resistant thermoplastic housing with finger-grip grooves. Blades are firmly embedded in body. Insulation piercing terminals, snap in unstripped wire. 15 amp, 125 volt. For cord sizes 16-2 and 18-2 SPT-2, 18-2 and 16-2 HPN. NEMA 1-15. High impact-resistant thermoplastic housing with finger-grip grooves. Blades are firmly embedded in body. Insulation piercing terminals, snap in unstripped wire. 15 amp, 125 volt. For cord sizes 16-2 and 18-2 SPT-2, 18-2 and 16-2 HPN. NEMA 1-15. Converts one outlet to three grounded outlets. Standard grade. Plug blades are firmly embedded in body. Resists chemical attack and stays flexible in extremely low temperatures. Large handle with solid brass blades. Polypropylene, PVC and thermoplastic rubber. Meets flammability requirements per UL 94. 15 amp, 125 volt. -20 to 70 degrees C. NEMA 1-15. Boxed. Standard grade. Meets all UL 498 requirements. Plugs blades are firmly embedded in body. 15 amp, 125 volt. .32" cord diameter. Straight, NEMA 5-15. Standard grade. Meets all UL 498 requirements. Plugs blades are firmly embedded in body. 15 amp, 125 volt. .32" cord diameter. Straight, NEMA 5-15.